How to Make the Most of Spotify: Maximise Your Release with EmuBands! Spotify is a music, podcast, and video streaming service. It is one of the largest music platforms in the world, and EmuBands are a recommended supplier. Through Spotify for Artists, it offers great resources to artists who make their music available on Spotify. We’re often asked by our artist community for advice on increasing their followers and play counts on Spotify. This guide will show you how to make the most of Spotify; the do’s and don’t’s! Important: This guide will lay out the best practices and recommendations based on Spotify’s own advice, as well as our personal experiences with helping thousands of artists release their music over the years. A crucial thing to bear in mind – this guide is designed to help you increase your followers, fans and how many streams you receive in an organic way. We would never recommend engaging with any service/person who guarantees you streams in return for money. We would also recommend never artificially manipulating the number of streams you receive (such as through excessive looping, or repeated plays). EmuBands takes this issue (known as ‘Streaming Fraud’) very seriously – be sure not to encourage your fans to engage in this behaviour either, as you may find your music is removed from digital services who have a zero-tolerance policy regarding streaming fraud and have systems in place to identify this type of behaviour. If your music is found to have generated streams in an artificial way, your music may be removed and any resultant royalties withheld. 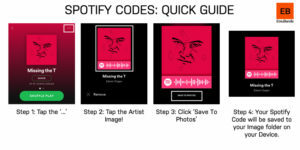 A lot of the stuff we’ll cover in this guide requires you to have access to Spotify for Artists. Once you get access, you can update your image, write your bio, post playlists, and much more. 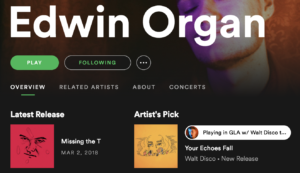 Alongside updating your bio, and using the Artist’s Pick feature on the Spotify for Artists app, artists also have the ability to edit and upload up to 125 custom images, from pictures on tour, shots in the studio or behind the scenes at rehearsals, this feature allows your Spotify listeners to become more engaged. In addition to this, through the Spotify for Artists web tool you can now link fans directly to your social media pages – such as Instagram, Facebook, & Twitter. By linking directly to your other platforms, your Spotify listeners can get to know you better, and keep up to date with your plans. If you’ve worked with a friend on a track, maybe it is a remix – maybe they’re singing on your track, Spotify makes it possible for you to credit everyone. 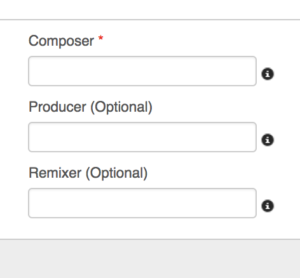 If you have a featuring artist, or a remix on your release, if you distribute through EmuBands, we’ll ensure it is credited properly, and the track will show on your artist page, as well as your collaborator’s page. This means that their fans and followers can find your music easily, too. Related: How Do I Add a Featuring Artist to My Tracks? Playlists are talked about a lot – when utilised properly, they can be hugely beneficial to developing a fanbase on Spotify. Spotify’s own editorial teams make millions of playlists – and they work tirelessly to discover the best in new music to include on their playlists. Spotify are focussed on finding the right music for every moment, and making sure that each listener on Spotify has a personalised listening experience. Spotify playlists fall into three basic types: personalised, editorial, and listener playlists. I’ll add another into the mix here – artist playlists. Let’s break these down a bit more. Personalised playlists, like Discover Weekly & Release Radar, will be familiar to you if you’re a Spotify user. These are created using algorithms, which work out what kind of music you like, and automatically create playlists every week, based on that information. The listening habits – what people share, what they save to their own playlists, what they skip, all come into play here. Spotify point out that whilst the process is automated, it has real people overseeing it. What is really important about personalised playlists, is that the more followers you have on Spotify, the more of these playlists you’ll be on. These are created by Spotify’s music experts from around the world. They sometimes specialise in different genres, and all of them have a careful understanding of listener habits, likes and dislikes. If you follow this guide, and all the best practices on the Spotify for Artists website, you’ll be giving yourself the best chance of being noticed by the editorial team. You can also pitch to the editorial team at Spotify, directly within the Spotify for Artists dashboard. Read our guide on this, here – How do I get on Spotify Playlists? Exactly what it says on the tin: these are playlists made by fans. Listener playlists help the Spotify algorithms learn more about the listeners, and as a result can actually help influence the personalised playlists I mentioned above. When fans save your music to their own playlists, it signals they like it! Spotify can use this information to recommend your music to people who have similar listening habits to your fans. These are playlists created by the artist community on Spotify – that means you! These are easy to set up through Spotify for Artists, and can be a great way of showing fans the music you like; maybe the tunes you’re playing in the van on tour, or songs that have influenced you through the years. It’s a great way to connect with your fans, and drive more people towards your artist page, and increase your follower count. Get creative with it! Artist-made playlists are important for your fans who listen on Spotify’s Free Tier, i.e., they don’t have a Spotify premium subscription. Spotify’s free tier has some limitations, one being, that mobile free tier users cannot play a single track on-demand. For this reason, we would recommend sharing a playlist link on social media, leading with your focus track, rather than just a direct link to the track. Artist’s Pick is a simple feature which is unlocked on Spotify through access to Spotify for Artists. The concept is simple: it allows you to feature a track, album or playlist, as well as concerts, and a reason why you’re sharing. You can even add images to accompany the post. A great opportunity to share your friend’s music – and tap into each other’s audiences. I mentioned concerts above. What do concerts have to do with Spotify? Through an integration with Ticketmaster, Songkick, Eventbrite, and AXS, your gigs will show up on your Spotify profile, and your fans will be notified via email about it. This helps turns your Spotify plays into ticket sales – I don’t need to explain why that is important! Another great feature of Spotify for Artists is the ability to sell your merch directly within the Spotify app. Through a connection with Merchbar, you can list and sell your tees, vinyl, CDs, etc – right on your profile. Followers: How Do I Get Them? There’s a number of ways you can increase your follower count on Spotify. Embedding a Spotify follow button in your website makes it easier for your fans to find and follow you. It’s simple code that works on any website. You can embed the button just by copying and pasting a short piece of code. For instructions, check out this website. Spotify’s Pre-Save feature allows fans to save a new track/release to their library, so that they can listen to it as soon as it is released. There’s ways to set it up, so that when someone pre-saves your music, they can also follow you at the same time. This is super-easy to set up. We would recommend using SmartURL‘s ‘Pivot’ feature. It’s free! We have a guide on setting up pre-save links for Spotify, using SmartURL: How do I set up a Pre-Save on Spotify? In 2017, Spotify introduced ‘Spotify Codes’ providing music lovers with a new way to discover and share music. Similar to scanning a QR code, by simply taking a picture on your phone, you can now easily share any track, artist, album, or playlist available on Spotify. To scan a Spotify Code, simply click on the camera icon located to the right of the Search bar, scan the artwork, and be directed immediately to that piece of content. Fans can scan a Spotify Code really easily. On Android and iOS – there is now a camera icon located to the right of the search bar within the Spotify app. Click the icon, scan the code, and you’ll be directed immediately to the track/album. As an artist or label, this open ups new and creative ways to engage with fans through Spotify. By uploading your Spotify code to your social media channels, fans can take a screenshot allowing them to link directly to your music. Display your Spotify code at live performances, for example, a print-out at the merch stall. Promote your code by printing it on your flyers, posters, Electronic Press Kits (EPK) etc. Spotify Codes are available worldwide for Android and iOS. To learn more about Spotify for Artists, pitching for inclusion on Spotify playlists, and other Spotify-related features, visit our Spotify knowledge-base. If you’re not currently using EmuBands for distribution, and you’d like to work with a distributor who gives you instant access to Spotify for Artists, and other great features, with no annual fees – click here join us today. If you would like to move to EmuBands from another distributor, read our guide on how to do this, whilst keeping your play-counts: Can I Switch To EmuBands from Another Distributor?